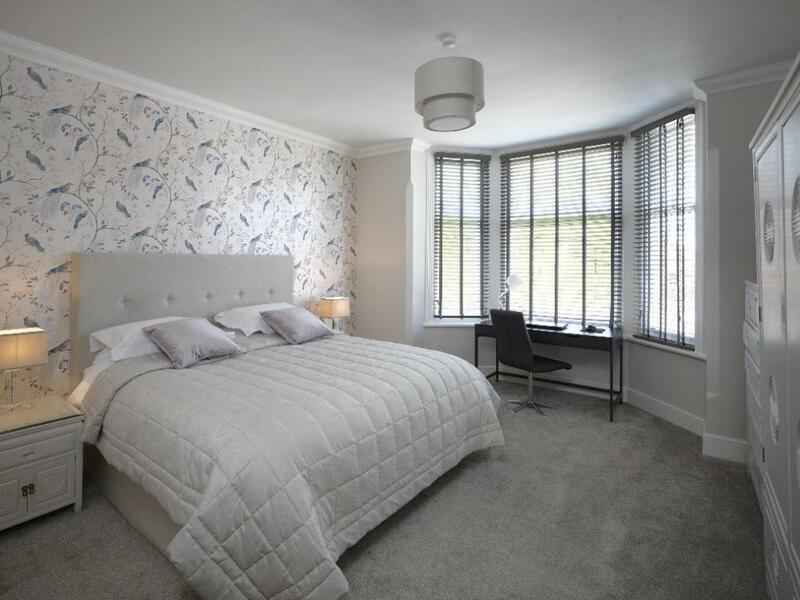 This beautiful apartment is located on the first floor, with wonderful bay windows in both the Lounge and Bedroom overlooking the front aspect of the house. It has a feeling of light and spaciousness, and has the best views of the lovely cherry and copper beach trees in the garden. The Lounge is open plan and airy, decorated in various shades of grey and cream creating a feeling of wellbeing. 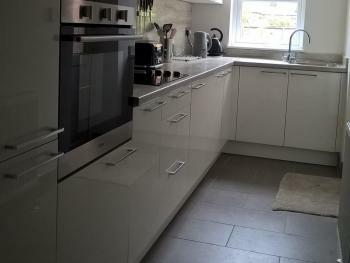 The German-manufactured Kitchen in cream and black complements this colour scheme, and includes a full sized oven; hob; microwave; washer/drier, and integrated fridge/freezer, plus a full range of pans; kitchen utensils; crockery and cutlery and glasses- in fact everything you would expect to find in a kitchen of this quality. 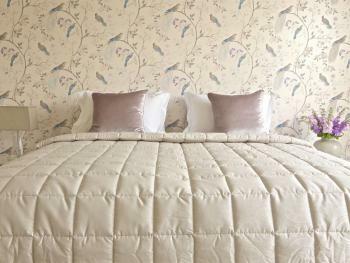 The large bedroom is decorated with a chinoiserie wallpaper; and opulently furnished with a large Queen-sized bed with lilac velvet cushions, and Egyptian-cotton sheets; duvet covers, and pillow cases provided by the Supplier to HM the Queen’s Royal Household. Also an Oriental suite comprising large wardrobe; a chest of drawers, and 2 bedside cabinets with lamps, plus an easy chair. 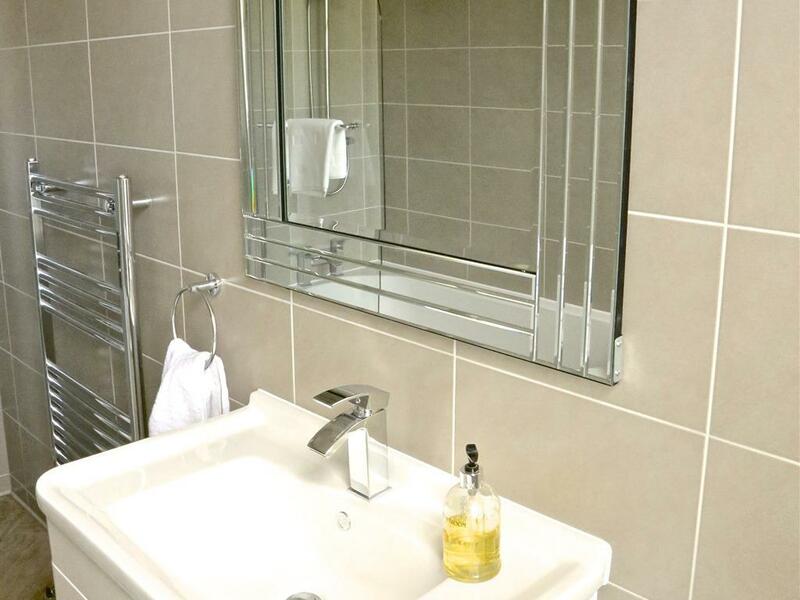 The spacious fully tiled bathroom has a bath with an integrated shower and large chrome shower head; a toilet; vanity unit with 2 large drawers; a heated towel rail, and a marble-topped Art Deco table to accommodate your toiletries. 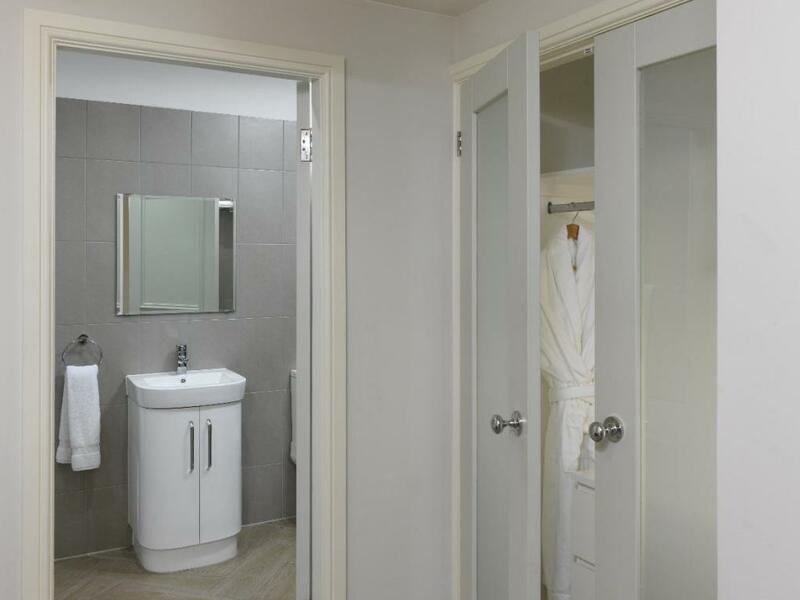 All towels are provided, together with a luxurious bathrobe and toiletries. 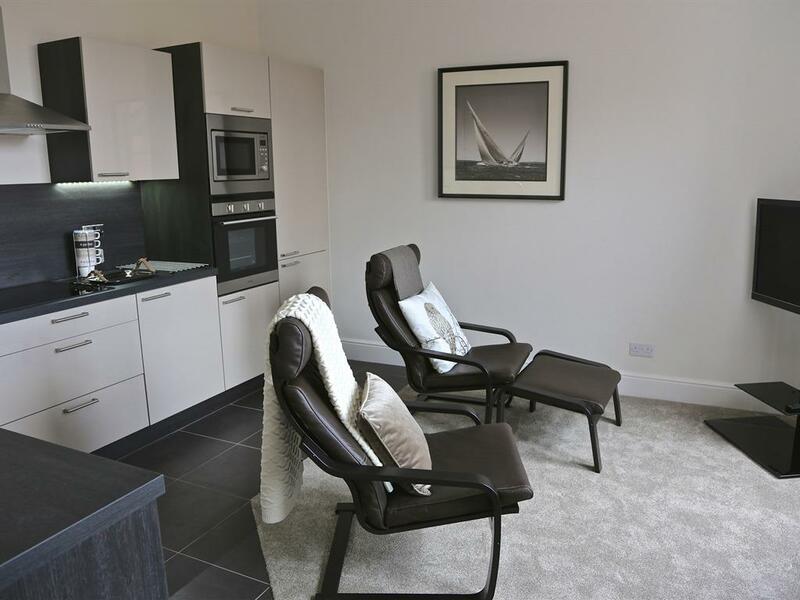 Ultra-fast fibre-optic Broadband is available throughout the apartment. 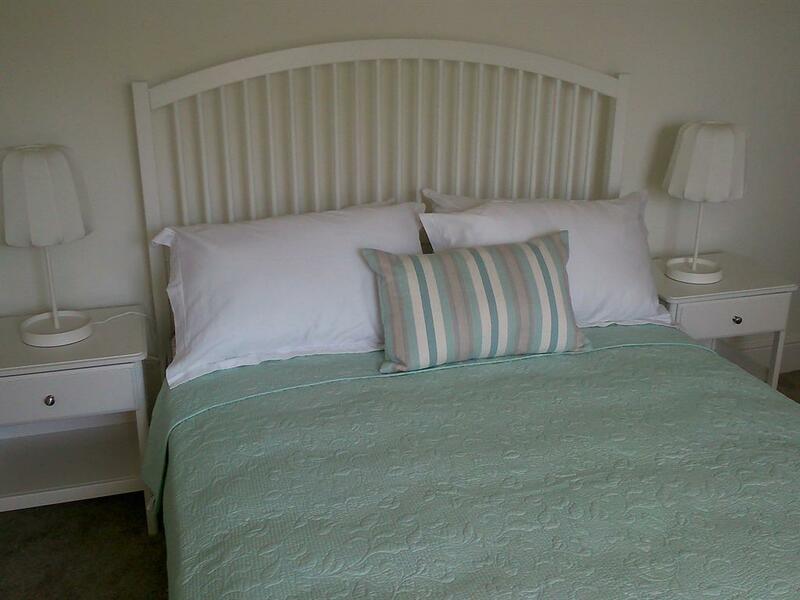 This is our special ground floor Studio Apartment, which has both a separate kitchen and a private bathroom. 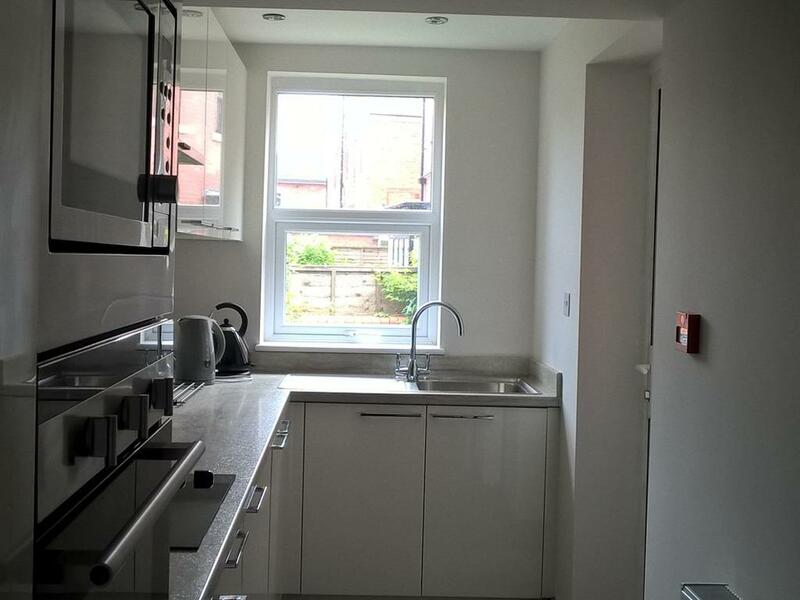 The fully equipped galley kitchen attracts the morning sunlight, and has direct access to its own private patio garden area. 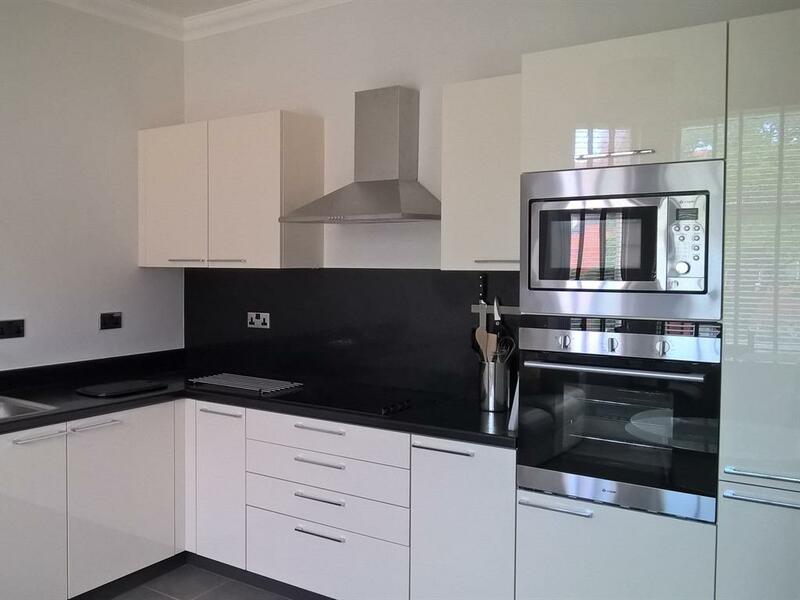 The German-manufactured kitchen in grey and white includes a full sized oven; hob; microwave; washer/drier, and integrated fridge/freezer. 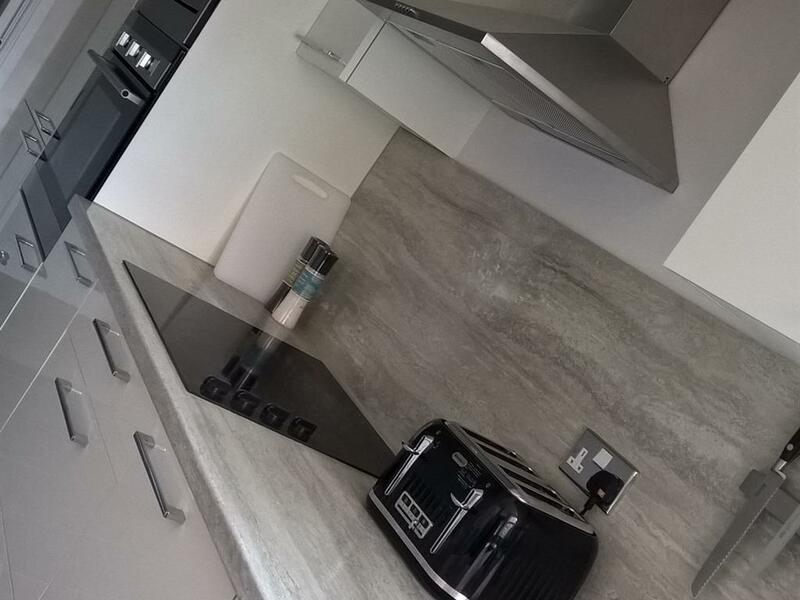 Also a full range of pans; kitchen utensils; crockery and cutlery and glasses- in fact everything you would expect to find in a kitchen of this quality. The lounge has a large bay window with dining table and chairs which overlooks the front garden’s cherry and copper beach trees. 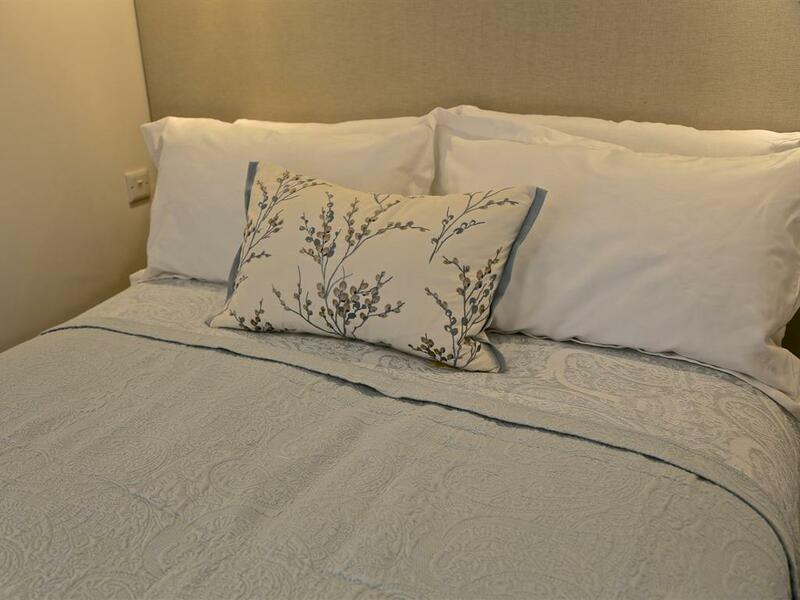 It has a stylish leather sofa, ideal for relaxing or viewing the 40” smart TV with SKY+ The comfortable double bed has Egyptian-cotton sheets; duvet covers, and pillow cases provided by the Supplier to HM the Queen’s Royal Household. 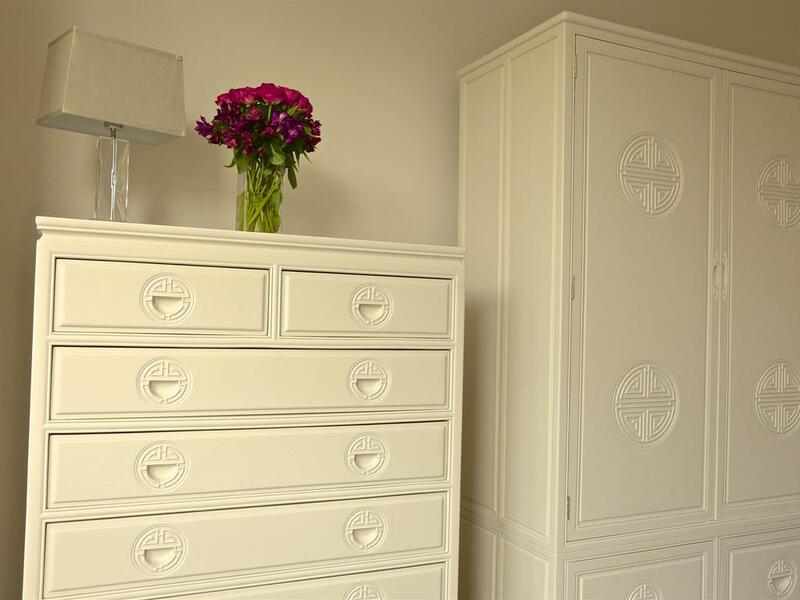 There is also a wardrobe; a chest of drawers and 2 bedside cabinets with lamps. 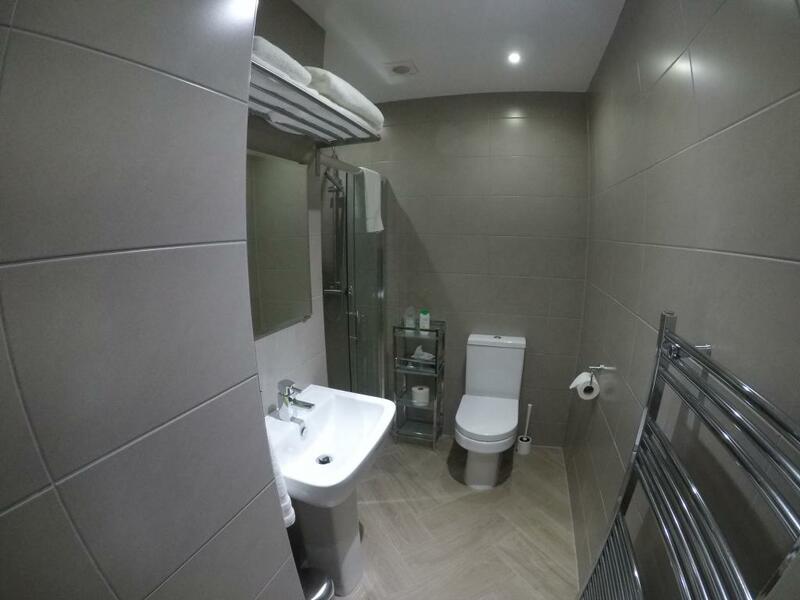 The adjacent fully tiled bathroom has a toilet; pedestal hand-basin; a shower cubicle with large chrome shower head, and a heated towel rail. 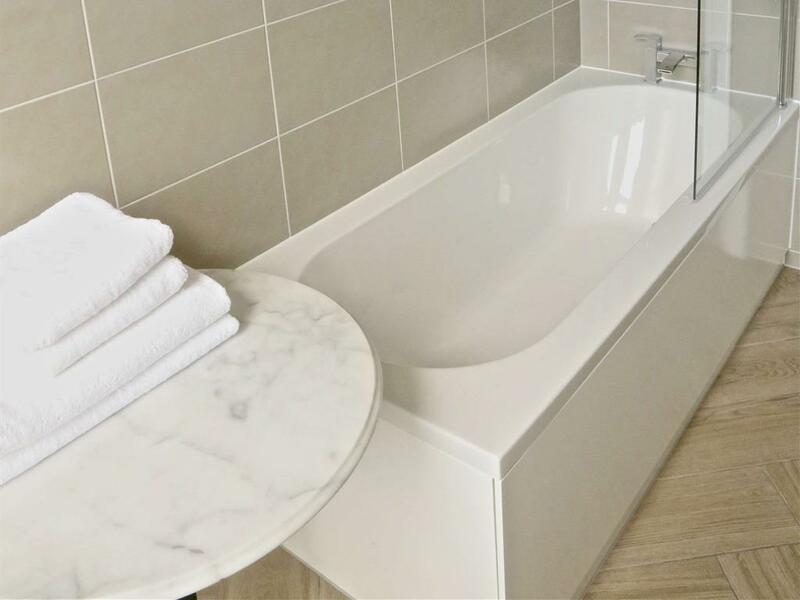 All towels are provided, together with a luxurious bathrobe and toiletries. 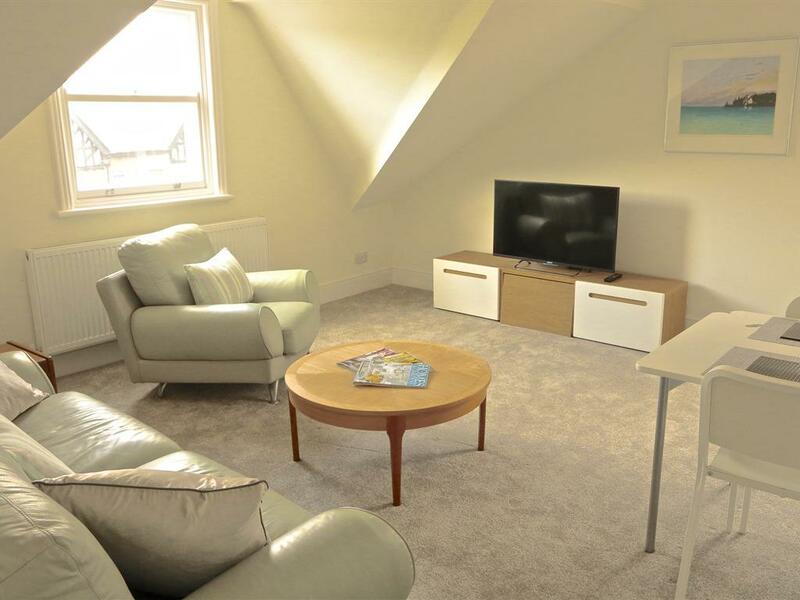 Free ultra-fast fibre-optic broadband is available throughout the apartment. 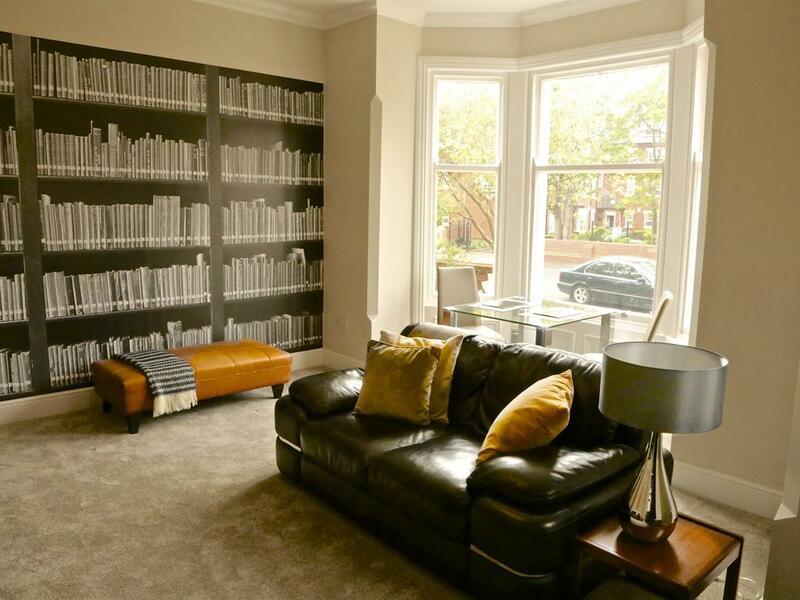 This rather grand ground floor apartment is spacious and light with contemporary furnishings. 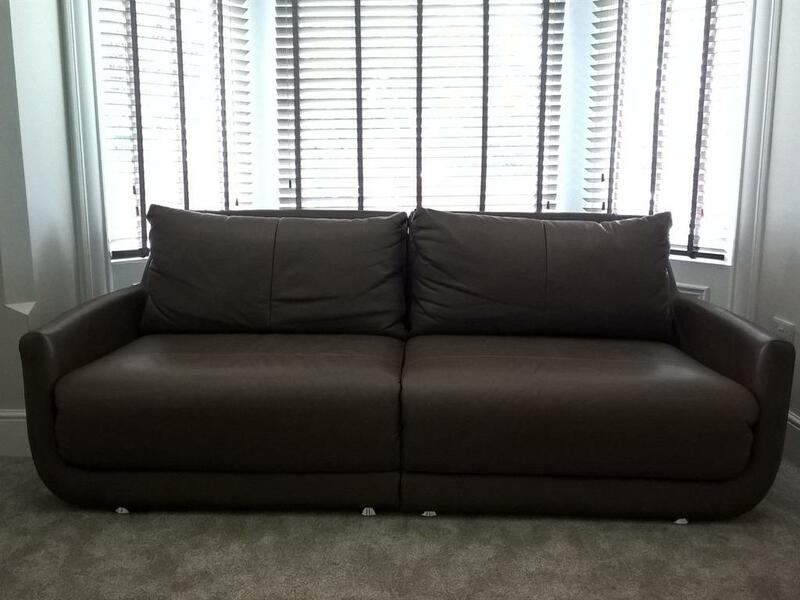 The lounge has an impressive large bay window with dining table and chairs; two stylish black leather sofas with comfortable cushions and a 55” smart TV with SKY+ -an ideal place for relaxing or even hosting a small business meeting. 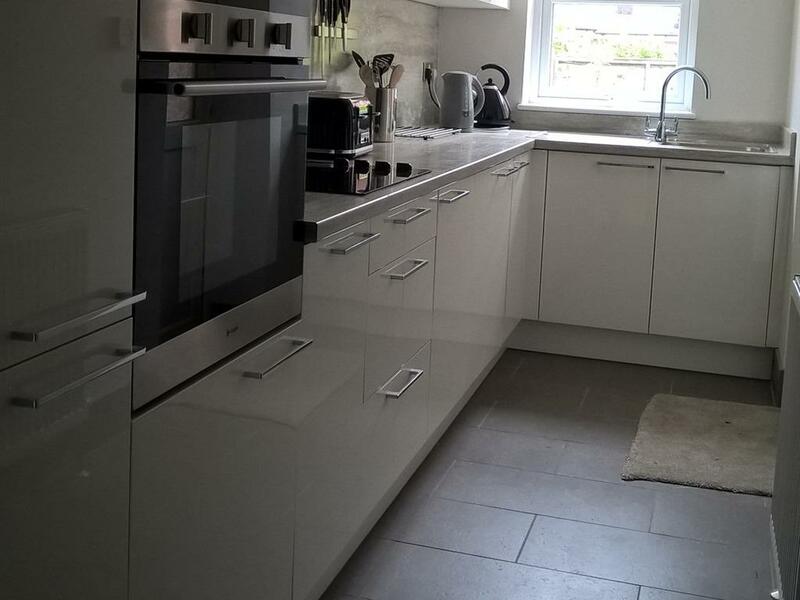 The German-manufactured Kitchen in black and white includes a full sized oven; hob; microwave; washer/drier and integrated fridge/freezer, plus a full range of pans; kitchen utensils; crockery and cutlery and glasses- in fact everything you would expect to find in a kitchen of this quality.The kitchen overlooks and has direct access to the private garden patio area. 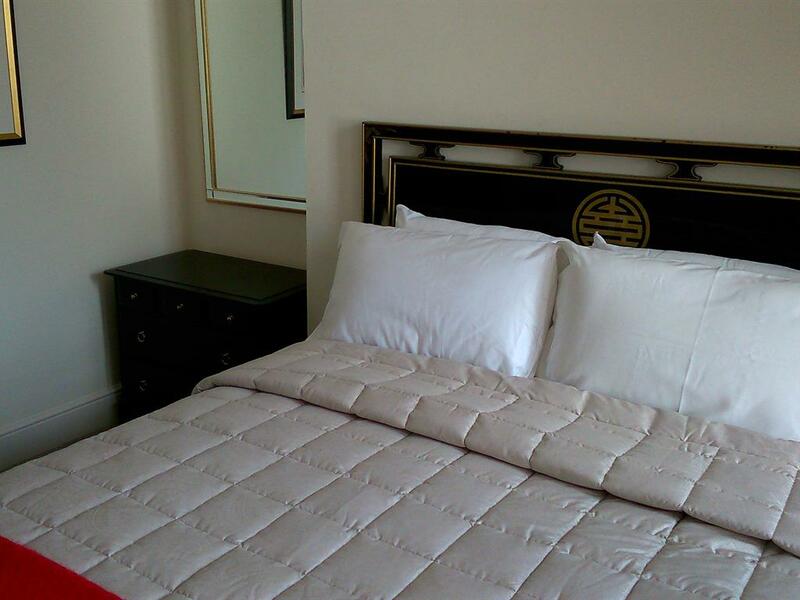 The double bedroom has a king-sized bed with a black lacquered headboard, and Egyptian-cotton sheets; duvet covers, and pillow cases provided by the Supplier to HM the Queen’s Royal Household. There is also a wardrobe with a chest of drawers and 2 bedside cabinets with lamps, and the windows overlook the south-facing rear garden. 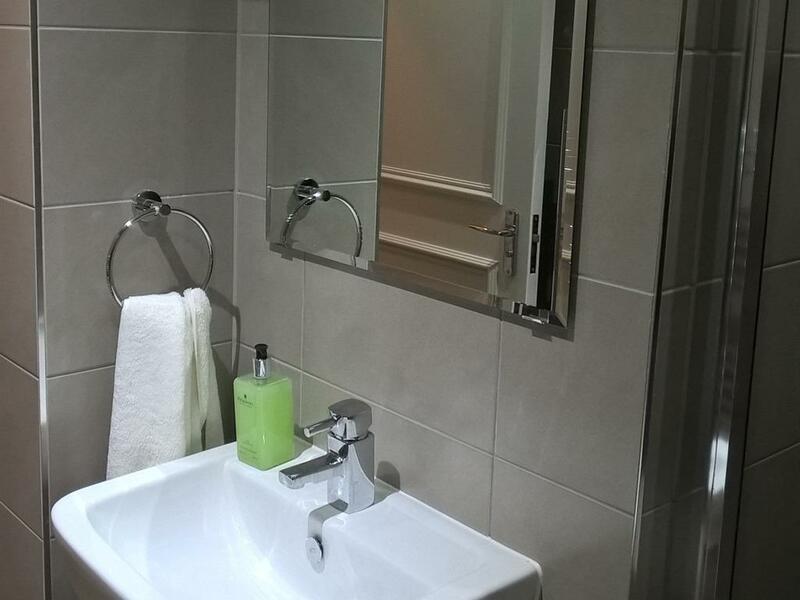 The fully tiled bathroom has a toilet; a large shower cubicle with chrome shower head; a vanity unit; a heated towel rail, and a chrome and glass stand to accommodate your toiletries. 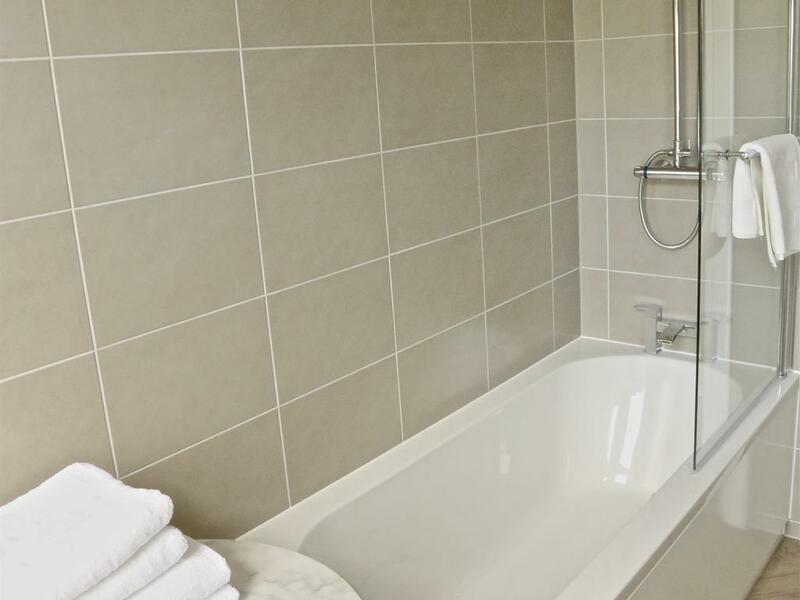 All towels are provided, together with luxurious bathrobes and toiletries. 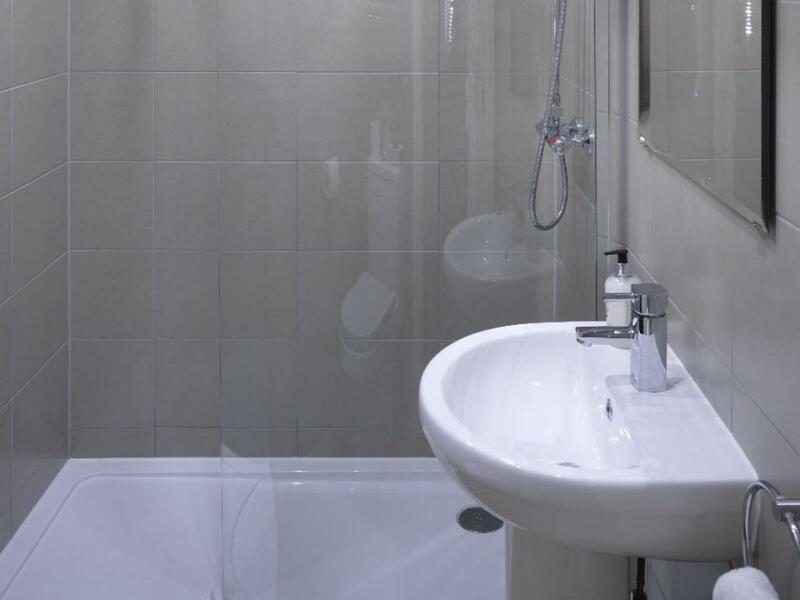 Ultra-fast fibre-optic Broadband is available throughout the apartment. 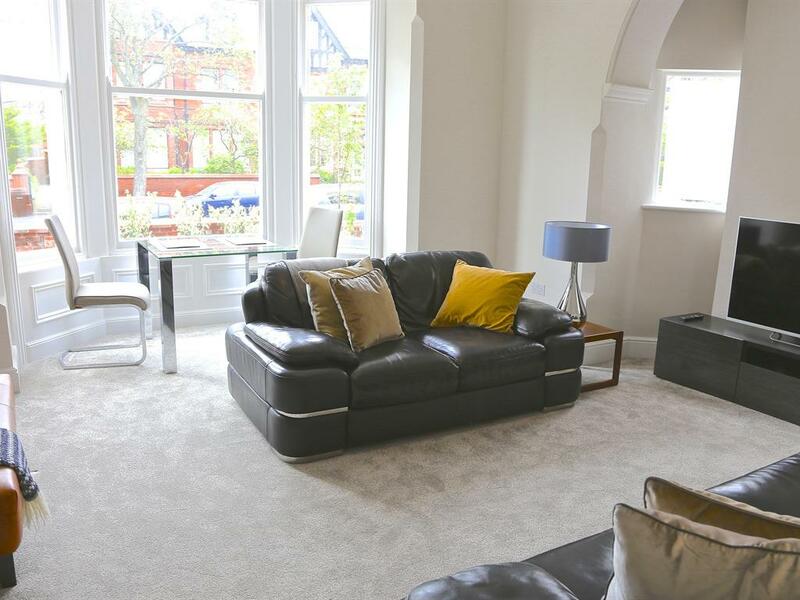 This superb apartment is on the first floor, and has an inviting square entrance hall, with a leather table and a large bespoke wardrobe/cupboard to house your personal belongings. 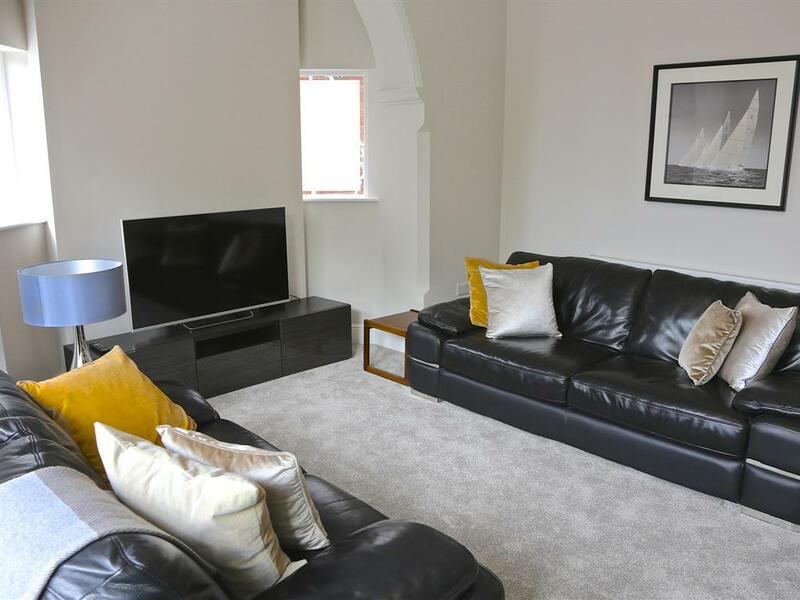 The Lounge is open plan with 2 leather and wood chairs with footstool, the perfect position to catch up on your favourite programmes on a 40”smart TV with SKY+. 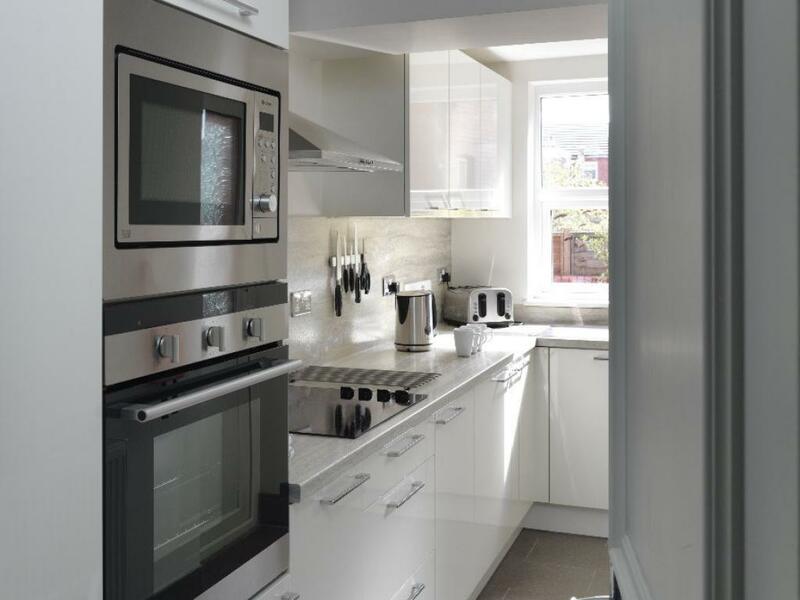 The Kitchen is fully fitted with a mocha gloss finish and plenty of cupboard and cooking space, and the dining table in the window overlooks the south facing rear garden which attracts the morning sun.The German-manufactured kitchen includes a full sized oven; hob; microwave; integrated fridge/freezer; a full range of pans; kitchen utensils; crockery and cutlery and glasses- in fact everything you would expect to find in a kitchen of this quality. 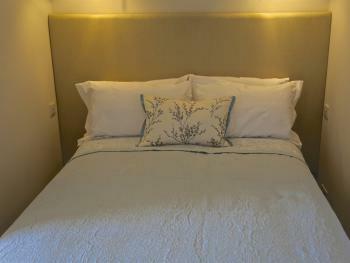 The apartment enjoys ultra-fast fibre-optic Broadband throughout. The bedroom has a double bed attractively recessed with bespoke padded headboard and 2 overhead lights to create a warm and comfortable haven to rest your head. There is also a desk and lamp with leather chair for all your work needs. 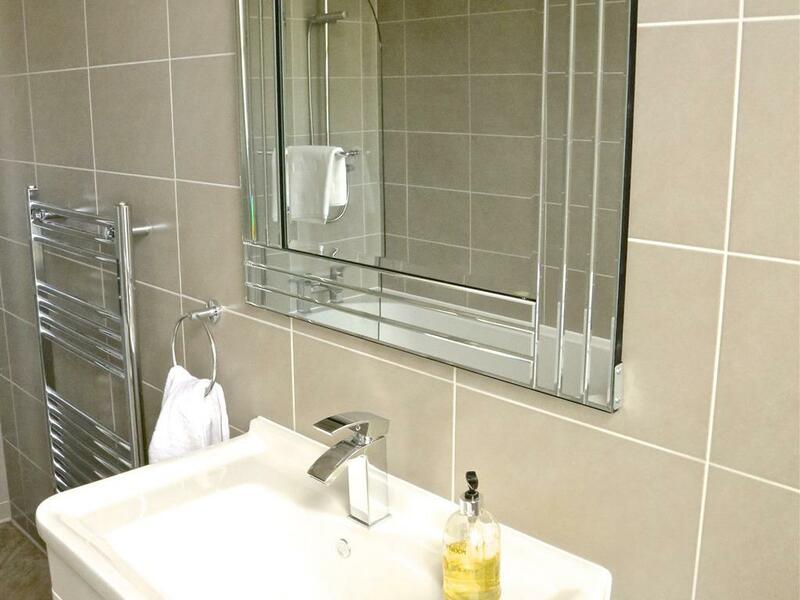 The fully tiled bathroom has a toilet; a bath and also an integrated shower with large chrome shower head; a vanity unit, and a heated towel rail. 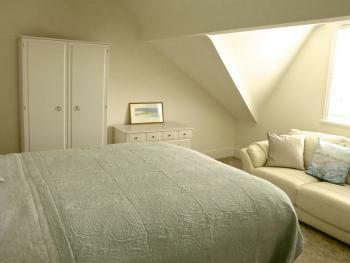 This is our loft apartment which occupies the whole of the top floor, and feels like an oasis of calm……. 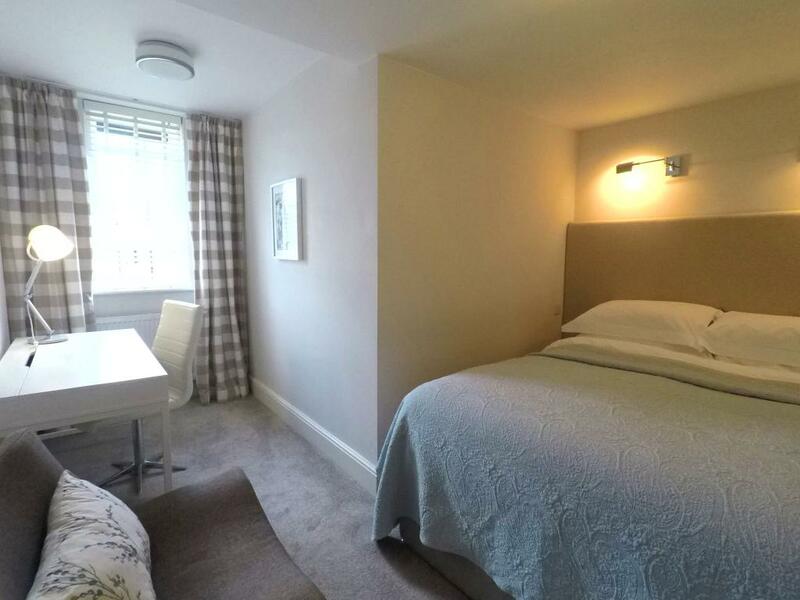 it is extremely private and quiet, and is the perfect place in which to retire after a hard day at work and be entertained by viewing the 46” smart TV with SKY+. 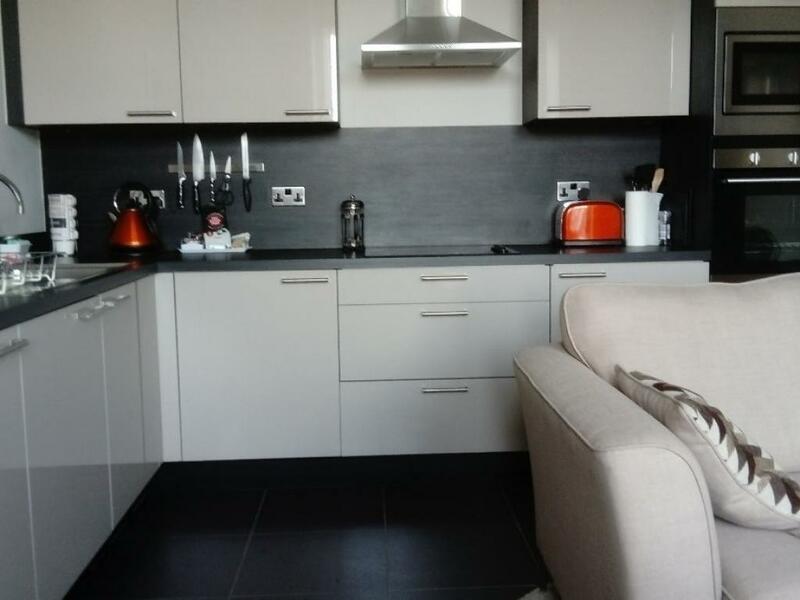 The Lounge is open plan with a large pale green leather sofa and comfortable leather chair; retro coffee table and fully fitted cream coloured kitchen with centre island. 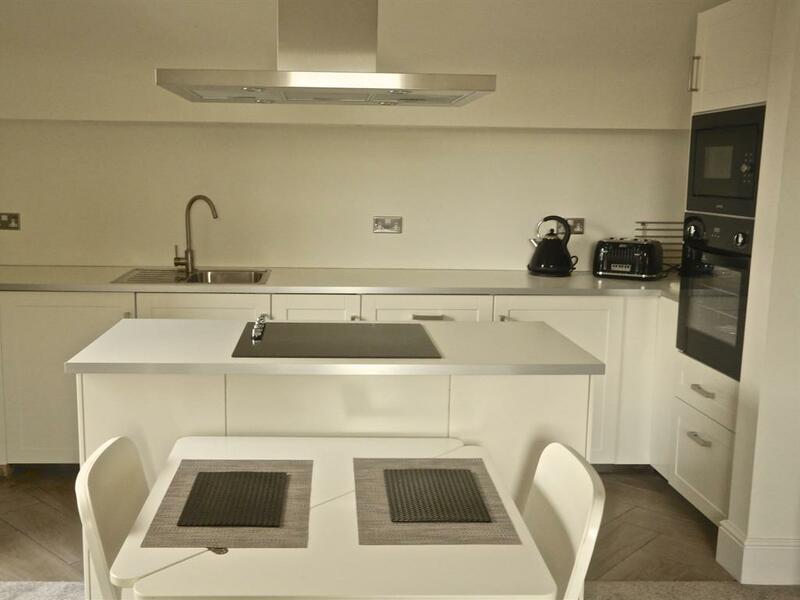 There is also a dining table and chairs. 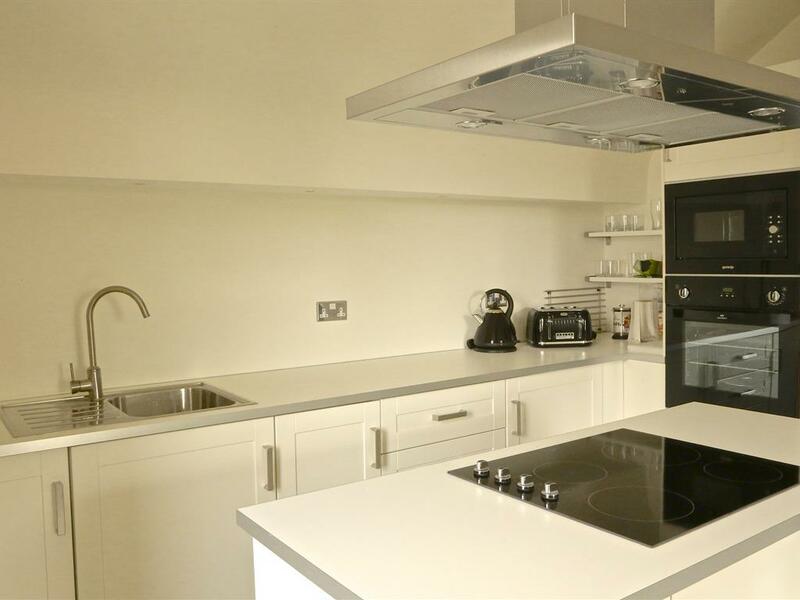 The kitchen includes a full sized oven; hob; microwave; integrated fridge/freezer; a full range of pans; kitchen utensils; crockery and cutlery and glasses- in fact everything you would expect to find in a kitchen of this quality. 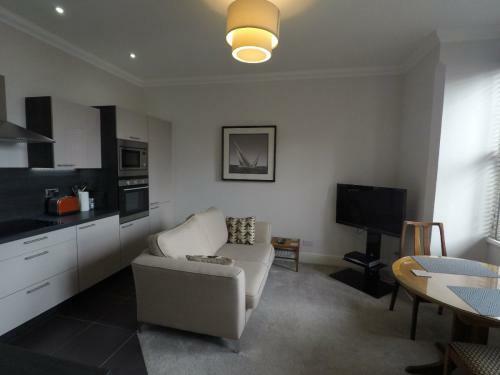 The apartment enjoys ultra-fast fibre-optic Broadband throughout. The separate spacious bedroom with King-sized bed and 2 bedside cabinets, has a cream leather sofa by the window, the perfect place to lose yourself in a good book. There is also a writing table with a lamp; a wardrobe and a chest of drawers. 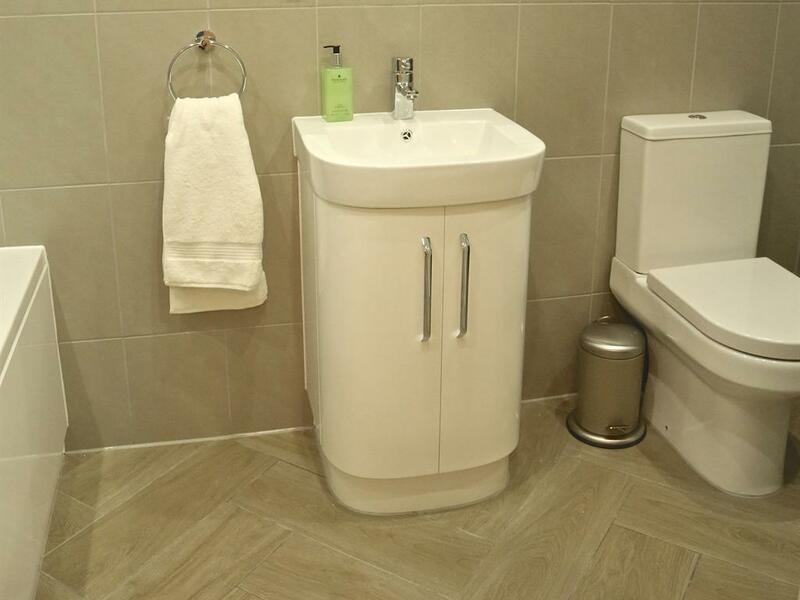 The separate fully tiled bathroom has a toilet; a bath and integrated shower with large chrome shower head; pedestal hand basin, and heated towel real. 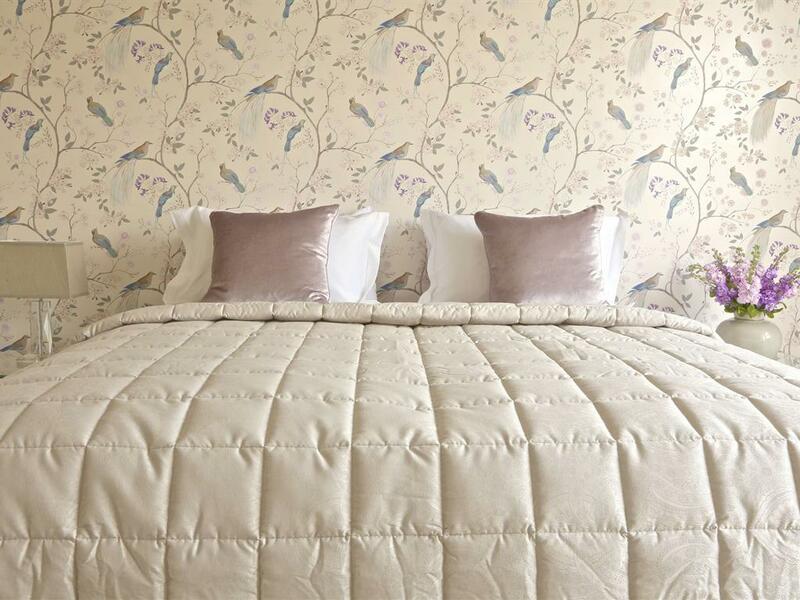 We feel sure you would be reluctant to leave this characterful apartment. 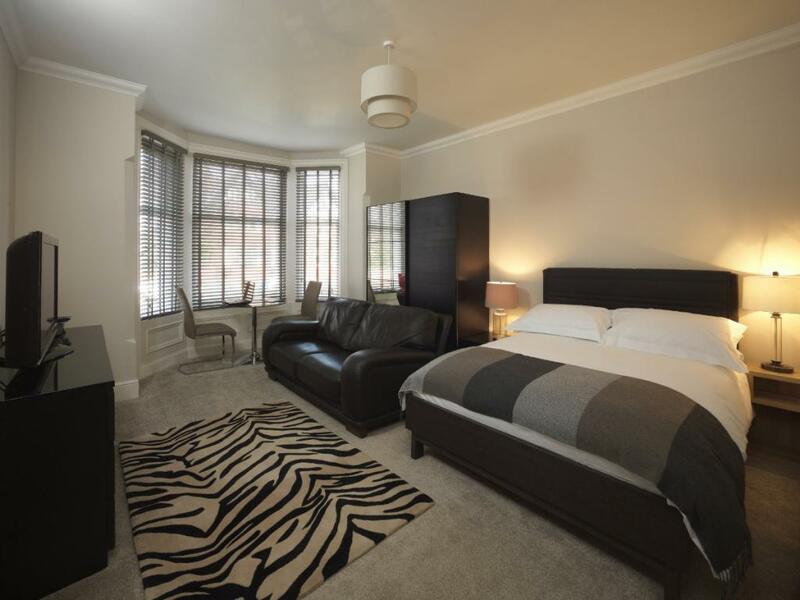 This beautiful period building has been totally renovated to the highest standards, retaining many its original features to create 5 unique luxuriously furnished one-bedroom apartments. 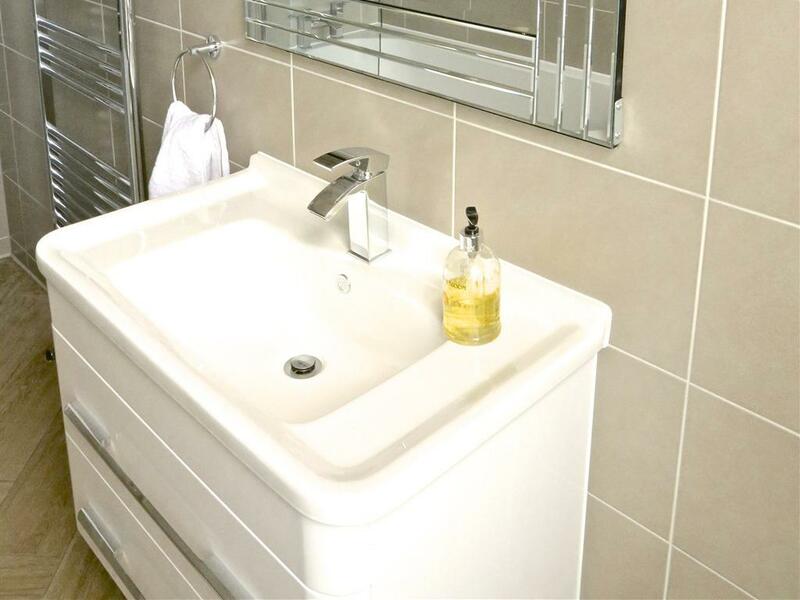 Each apartment has a lounge with dining area; a master bedroom; a fully tiled bathroom with bath or shower cubicle; heated towel rail and toilet, plus a well equipped kitchen with a full range of high quality kitchen utensils; crockery and cutlery. 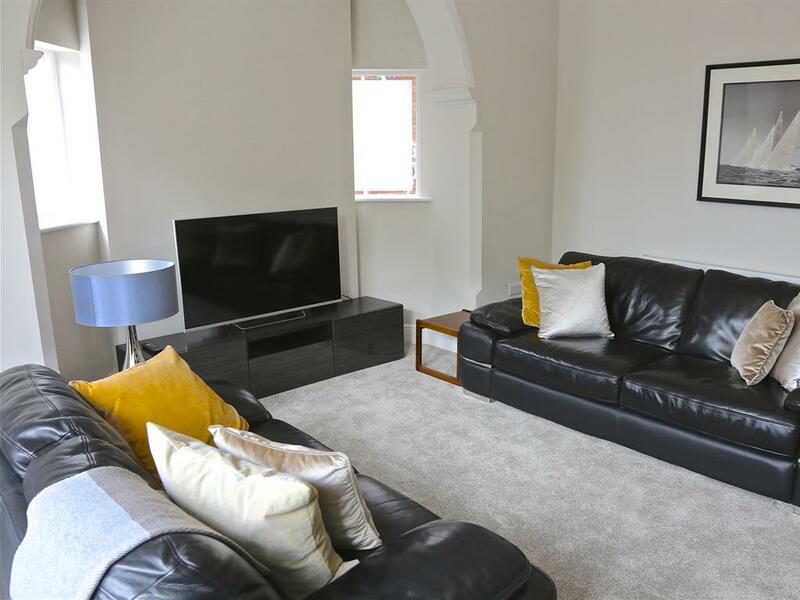 Each lounge has comfortable leather furniture; pictures and a large screen smart TV with free SKY+ with ultrafast fibre-optic Wi-Fi hard-wired throughout the apartments. 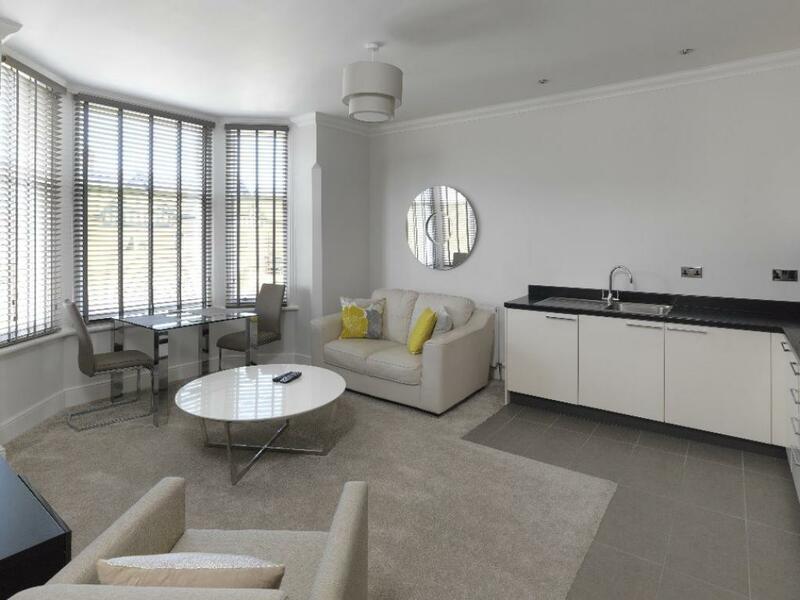 Each apartment has a totally individual design, with furnishings having been suitably chosen with great care and attention to detail. This eclectic mix of styles work harmoniously together to create a building with its own unique personality and immense charm. In the hallway the original mahogany balustrade, the Victorian cornices and stained-glass window have been lovingly restored. The chandeliers create magical reflections on the walls, and with a high quality carpet in which to truly sink your feet, your first impression of the building will be certain to make you feel most welcome, and very much at home. The building is conveniently located just a 5 minute stroll to the beach; promenade, and renowned Royal Lytham St.Annes Golf Club, and only a little further to the St.Annes shopping centre, with its wide range of shops; supermarkets; restaurants and bars. 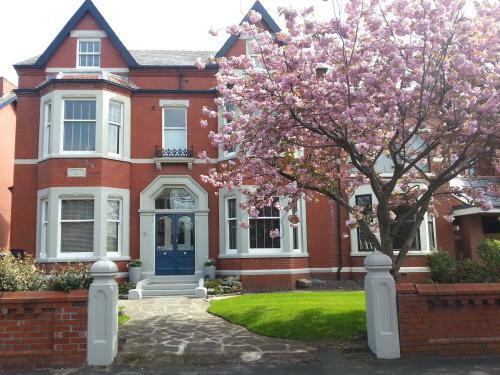 For golfers, in addition to the nearby Royal Lytham Club, the other three championship golf courses of Old Links; Fairhaven, and Green Drive are less than a 10-minute drive away. A 15 minute drive inland brings you into lovely countryside, while the beautiful Trough of Bowland and Lake District are little more than an hour's drive away. A short drive up the coastal road takes you to Blackpool, with its Pleasure Beach; its splendidly restored promenade; the famous Tower Ballroom and Grand Theatre. 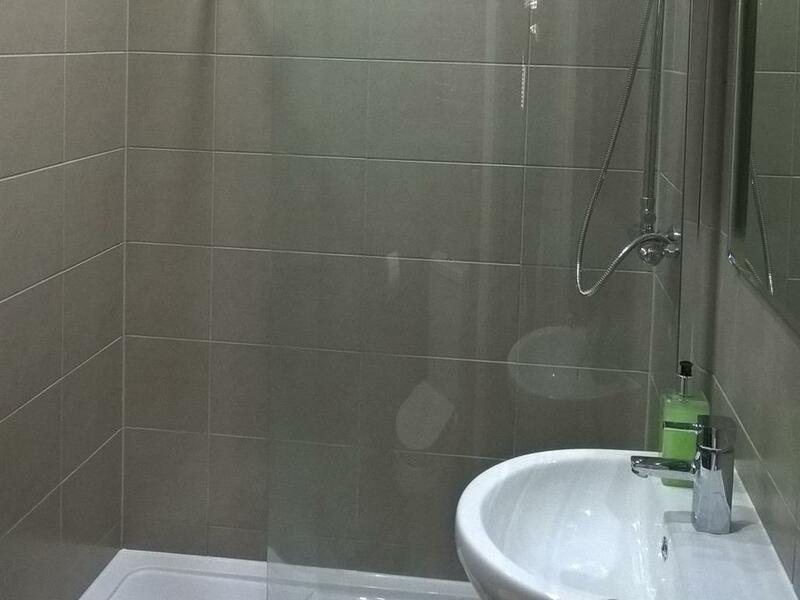 None, other than a Walk-in Shower in both ground floor Apartments 1 & 2. A taxi rank is situated adjacent to St.Annes-on-Sea Railway Station, and the journey time is under 5 minutes to the property. If changing trains at Preston, please ensure you take the Blackpool South train rather than the one to Blackpool North. Also ensure that you do not disembark at Lytham Station but continue your journey until you reach the station at St.Annes-on-Sea.